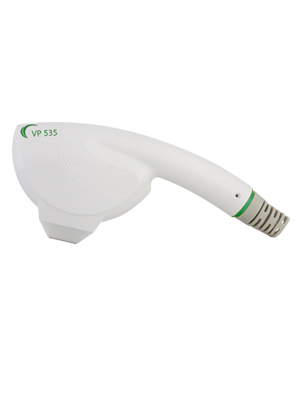 For treatment of vascular and pigmented lesions, the VP 535 handpiece is ideal. The ergonomically designed handpiece emits a green wavelength at the range of 535 – 950 nm. Its spot size is 3.4 cm2 and its fluency ranges from 5 – 25 J/ cm2. Depending on the skin type and lesion type, you can select between three types of DPC pulses- smooth, long and high. The software of the handpiece automatically sets the treatment parameters, but they can also be set manually. The handpiece has been ergonomically designed for ease of use and quick access to all body areas. It comes with a Sapphire contact cooling tip that protects the epidermis and which can be operated at either a low, high or off mode.